Scientists have just reported that 2014 was the warmest year ever recorded, providing more evidence that manmade carbon emissions are accelerating global warming and threatening to do more extensive damage to the planet’s ecosystems. Here in Oklahoma, many people are worried about the world oil glut and lowering gasoline prices, which are already damaging the state’s economy. But it’s precisely the burning of fossil fuels produced in energy states like Oklahoma and elsewhere in other countries that is contributing to the much larger problem-some would argue the world’s greatest challenge-of climate change. The National Oceanic and Atmospheric Administration (NOAA) and NASA, according to media reports, have concluded the average temperature in 2014 was, respectively, 58.24 and 58.42 degrees Fahrenheit. This is more than 1.2 degrees above the twentieth-century average. NOAA reported that nine of the ten warmest years ever recorded have come since 2000. Meanwhile, scientists reported in September that Arctic sea ice was at its sixth lowest level ever recorded. Arctic ice reflects ice back into the atmosphere cooling the planet. Less ice means a warmer planet. Scientists throughout the world have long argued that growing carbon dioxide emissions from the burning of fossil fuels in vehicles and energy plants increase what is known as the greenhouse effect. The greenhouse effect, a natural phenomenon, is when carbon dioxide, methane gas and water vapor, get entrapped in the atmosphere causing the planet to stay warm. But too much warmth can cause damage to the environment in several ways: Rising ocean levels caused by melting Arctic ice threatening coastline property, longer and harsher droughts diminishing the world’s food supply, extinction of wildlife disrupting natural habitats and extended heat waves killing people. Some of those problems have obvious major consequences. For example, rising ocean levels could submerge millions of buildings and homes throughout the world in water, forcing massive human displacement. Droughts kill growing crops and reduce the drinking water supply. Other problems, such as wildlife disruption, which include insects, don’t necessarily have one clear and shared consequence, except in cases like fewer fish, a major world food source. Republicans, most notably Oklahoma’s U.S. Sen. Jim Inhofe, have denied that manmade carbon emissions have contributed to global warming. It’s widely known that Inhofe claims scientists throughout the world are involved in a leftist conspiracy aimed at hurting oil and gas companies and that the warnings of the impact of global warming are simply a “hoax.” He has also argued that only a god could impact the environment in any major way. “The arrogance of people to think that we, human beings, would be able to change what He [a god] is doing in the climate is to me outrageous,” Inhofe once said in an interview. 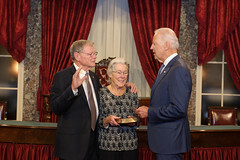 That’s Inhofe and his wife with Vice President Joe Biden pictured right in a recent Senate swearing-in ceremony. Inhofe is now chair of the U.S. Senate Environment and Public Works Committee and has announced he will fight to rollback rules by the Environmental Protection Agency to protect the environment from pollution while reducing carbon emissions. Meanwhile, in other Oklahoma-related news, the hydraulic fracturing or fracking boom in this state and others has contributed to a world oil glut that has dropped the price of a barrel of oil below $50, a steep drop from the $100 to $110 a barrel range last summer. This means oil and gas companies here are planning to reduce production, which means fewer jobs and less tax revenue for the state. So Oklahoma gets it all ways. The fracking bust could very well lead to a major economic downturn in Oklahoma, not experienced since the 1980s. Yet the fracking boom produced more of the carbon dioxide that leads to environmental crises, such as the current extreme drought in western Oklahoman that’s creating a major agricultural and water crisis in the state. Oklahoma also now leads the lower 48 states in the number of 3.0-magnitude or higher earthquakes, which scientists argue are caused by the wastewater injection well process used in the fracking process. None of this will probably impact Inhofe’s quest to add as much carbon dioxide as possible to the planet’s atmosphere. It’s important to note Inhofe has received more that $1.7 million in campaign contributions from the oil and gas industry, according to OpenSecrets.org.